It had never crossed my mind to make a Wikipedia entry as I must admit that I never thought of Wikipedia as a reliable source of information and even more as a source that I would refer to in my academic writings. Of course I turn to Wikipedia for more trivial issues, like chat abbreviations that I am not aware of and I want to instantly check what they mean! In additon, the Greek version of Wikipedia is quite disappointing. Lacks of many or most encyclopedic content that one would expect to find. What makes things worse is that most of the articles are a shorter version of articles in English that lack a lot of crucial information. This is not too bad though when you search for the translation of a technical term or a term of new technology that is not yet commonly used in Greek and sometimes we don’t even know how to translate it. English words are dominating computer relating everyday language of Greeks so words like “mediated communication”, “interface”, “context-aware”, “instant messaging”, “chat-room” are not easy to be translated and sometimes the translation gets so periphrastic that you don’t immediately understand what they mean! That is also the case with locative media. When I try to use the Greek translation nobody understands of what I am talking about. Usually I have to explain what I mean by just saying two words: locative media, yes in English.. so my Greek interlocutor can understand to what I am referring to. For that reason I thought that it would be useful to translate the term locative media and the content that exists in the English Wikipedia page to Greek and to refer to some Greek bibliography. My greek wikipedia page can be found here: Μέσα επικοινωνίας δι’ εντοπισμού. My page was not deleted but it has been flagled as “in need of editing”. Though i tried to make some improvements by correcting some of my references, signing the article, adding an category, i had no response or dialogue in the discussion page. 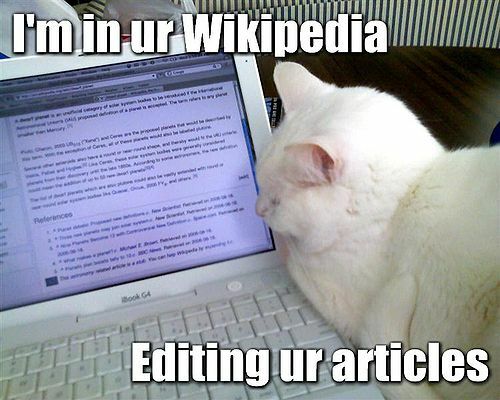 « Wikipedia editing: the ultimate career counseling? Greek Wikipedia calls for Βοήθεια (Help)!